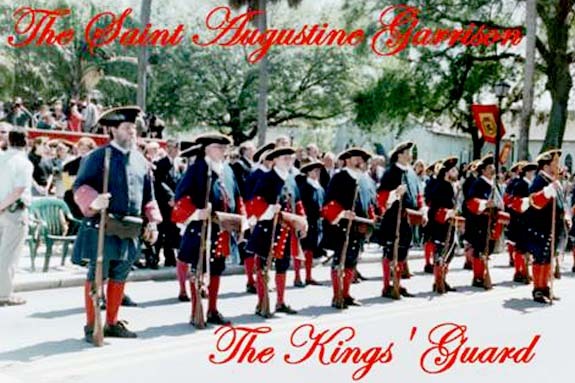 The Saint Augustine Garrison is very proud of the distinction of being named the Kings’ Guard. In 2001, King Juan Carlos I and Queen Sophia, the reigning monarchs of Spain, visited Saint Augustine. During their visit King Juan Carlos I, in a proclamation named the Saint Augustine Garrison as his own personal guard. No other re-enactment group in the history of the United States has ever been bestowed such a distinguished honor, by a head of state. 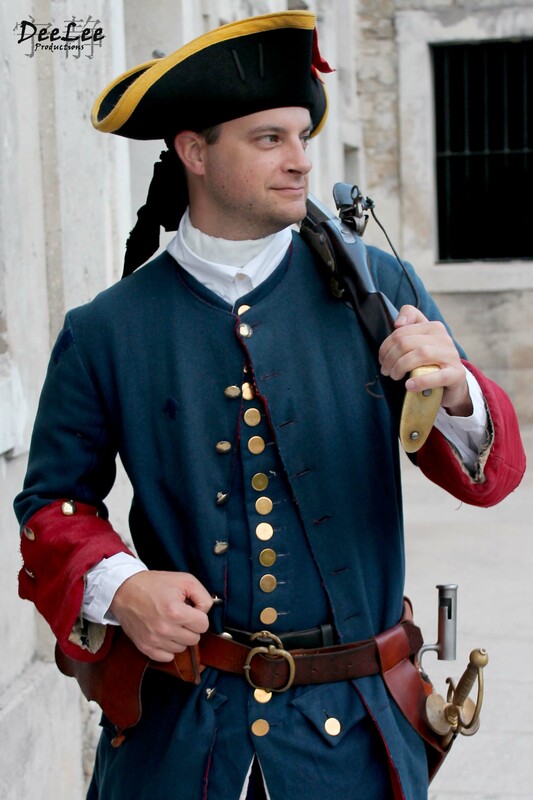 The Saint Augustine Garrison is a group of re-enactors who portray the life and times of the Spanish soldiers and their families in 1740s Colonial Spanish Saint Augustine. The Saint Augustine Garrison was created in July, 1984 by the Historic Florida Militia, Inc. a 501 (c) 3, Non-Profit Corporation. Their mission is to foster an understanding of military history of early Spanish Florida through military demonstration, interpretive programs, portrayals and publications and to provide visitors of the Castillo de San Marcos and Fort Matanzas a trip back into time of 1740 Spanish Saint Augustine. Members of the Garrison are volunteers. Uniforms, weapons, crafts, clothing, tools, and period items are provided at their own expense. Because a complete uniform including musket can cost upwards of $2,000, the Garrison maintains a collection of ‘loaner’ gear for temporary use by members. Members can get paid for participating at various events and are expected to use money earned towards purchasing/upgrading their own uniforms. 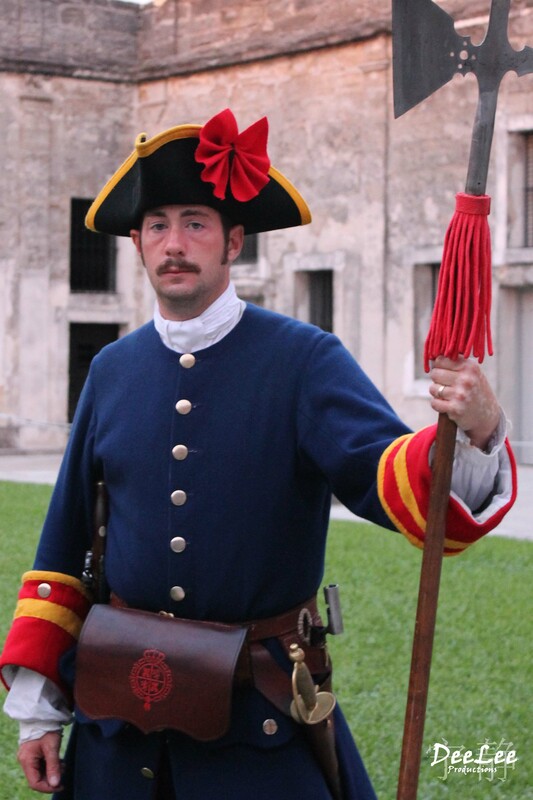 Extensive research has been devoted to historical accuracy, to recreate 1740 period clothing and weapons used by the soldiers and their distaff during this time period. Often the Garrison will travel outside St. Augustine to attend events in other cities and states. Travel expenses incurred for out of town trips are usually paid by members themselves. On occasion some of these events are partially sponsored by municipal governments or private organizations. Funding is provided to offset a portion of individual expenses incurred by the members. Membership into the Garrison is open to men, women, and families. You must be 16 years old before participating in weapons demonstrations. Members, who participate in black powder weapons demonstrations, must complete the safety course offered by the National Park Service and become certified. Certification classes are offered twice a year (in the spring and fall) and cover both artillery (cannons) and smoothbore muskets, a small fee to cover course costs may be required by the NPS. At events involving weapons demonstrations, current NPS Black Powder Safety Regulations will be followed. All weapon demonstrations are supervised by trained SAG Safety Officers, who have achieved their position through training, experience, and NPS Safety Certification. Saint Augustine, during this time period was a remote outpost on the fringes of the Spanish empire established to protect the Spanish treasure fleets, returning to Spain along Florida’s east coast. Daily life was extremely difficult for soldiers and their families, not only were they under constant threat of attack from hostile Indians, there were also British invaders laying claim to Spanish territory from the north. Relief supply ships and reinforcements from New Spain (Mexico) sometimes took years to arrive. It truly was a struggle to survive in this extremely harsh environment for those who lived in the first continuous colony in the new world. Replacement troops for the fort were usually born and raised in the town and came from families of the soldiers living here. The clothing weapons and training came from the families of the soldiers themselves who were made up of generations of Spanish, Blacks and Indians that frequently intermarried. The Spanish didn’t have as many slaves in Florida as the English had in their colonies to the north, as it was basically a military outpost rather than a plantation economy. As the British settlements moved farther and farther south, the Spanish adopted the policy of giving sanctuary to slaves who could escape from British plantations and made their way to Florida. Thus did it become the focal point of the first Underground Railroad. Blacks were given sanctuary, arms, and supplies if they would join the Catholic Church and swear allegiance to the king of Spain. They established Fort Gracia Real de Santa Teresa de Mose (North of the city) that became a vital part of the defensive line of the Garrison at Saint Augustine. As a member of Historic Florida Militia, Inc., a 501c 3 non-profit educational organization, we are covered at all events by a comprehensive Liability Insurance Policy. Certificates of Insurance are available upon request. 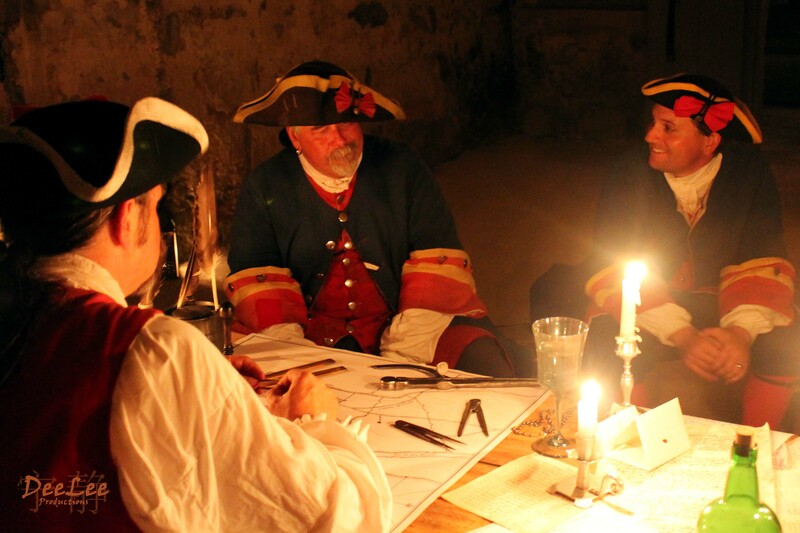 The St. Augustine Garrison is seeking new members. You must have a positive attitude and a desire to interact with the public. A complete kit can be expensive and take years to acquire. In the meantime you can borrow our gear (must be returned after every event). We holds monthly meetings. Any who are interested in learning more are welcome to attend. See the meeting schedule here! Visit Our Facebook Page for the latest info!